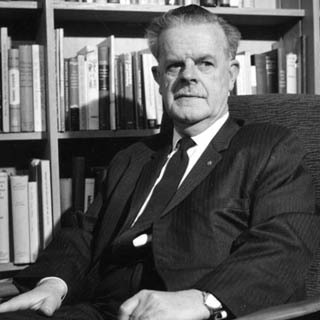 Sir John Crawford was a great Australian civil servant and a distinguished leader of the Australian National University. As an official and as a scholar, he exercised remarkable influence nationally and internationally. He was a key player in reorienting Australian economic policy in the mid-twentieth century and, along with a few counterparts in Japan and the United States, a pioneer in the building of an Asia-Pacific economic and policy community. Born in Sydney in 1910, Sir John’s policy influence began early when in 1942 he joined the Department of War Organisation of Industry, and in 1943 was appointed Director of Research at the Department of Postwar Reconstruction. After the war his influence expanded in 1945 as Director of the Bureau of Agricultural Economics, then Secretary of the Department of Commerceand Agriculture, and later Secretary of the Department of Trade. In this capacity he was a key architect in the reshaping of Australia’s trade relationships with both the United Kingdom and Japan. Beyond his many specific policy contributions, Sir John argued consistently for very high standards of public administration. He was a pioneering advocate of the need for strong and powerful analytic capabilities in civil servants. In reviewing Sir John’s contributions to public administration, John Uhr has described this as the “Crawford doctrine (pdf, 26KB)”. In 1960 Sir John took a different path, joining the Australian National University as inaugural Director of the Research School of Pacific Studies and Professor of Economics, later as Vice-Chancellor in 1968 and Chancellor in 1976. His leadership of the University left a long legacy of scholarly excellence and public contribution. Mirroring the aspirations of our School today, his influence on policy and drive to engage Australia with Asia and the Pacific continued from within the University. From his university base Sir John played a foundational role in the establishment of the Australian Development Assistance Agency, the Industries Assistance Commission, the Australian Centre for International Agricultural Research (ACIAR), and Consultative Group on International Agricultural Research. Among the many long-term projects he pursued was the promotion of trade relations around the Asia Pacific region and development assistance work, especially in India (through technological innovation in agricultural) and Papua New Guinea. We think this is a wonderful legacy with which to associate ourselves and one that captures a central part of our mission as a graduate policy school. It is a legacy that sets the standard for all our staff and students.